What's it like to be a ‘hairy, screaming kid’ followed by six million people? 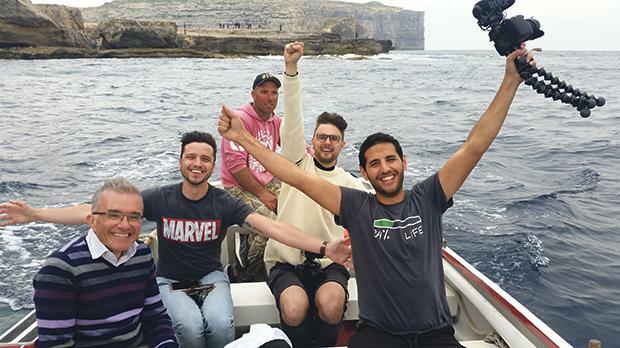 With the Nas Daily team and the mayor of San Lawrenz, Nas (right) enjoys a boat ride on the Gozitan coast. 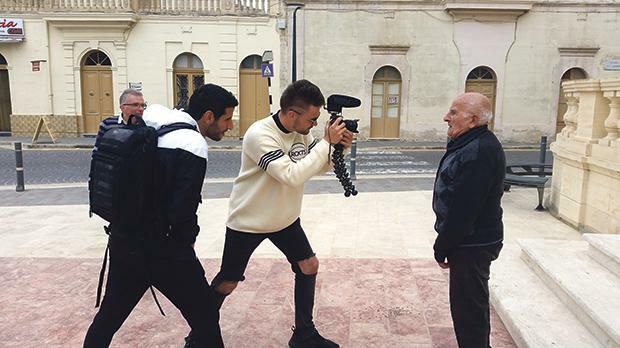 It is a cloudy morning in Malta and Nuseir Yassin – known to his fans as Nas – is worried about the weather for filming on Gozo. We meet in his executive suite in a top five-star hotel, whose corporate sales manager tells me she is happy to provide the suite free of charge in exchange for a single mention on Instagram. Such is the power of social media influencers like Nas. Born to a Palestinian family in Nazareth, Israel, he eventually moved to New York, where he worked as a software engineer earning $120,000 a year, until one day he decided to quit and follow his passion, because he “needed a 52-year holiday”. With $20,000 in savings, he began to travel the world and focused all his energy on his Facebook page Nas Daily, where he delivers a one-minute inspirational video each and every day. Some criticise his sensational and commercial style, but the fact remains that his videos are validated by six million people. Obviously, Nas is doing something right. Some of his followers share their personal, inspiring stories through an online group that boasts 100,000 members. When he met Facebook founder Mark Zuckerberg earlier this year, his episode page was upgraded to the prestigious ‘show’ status. It is already 10am and Nas is panicking as he realises he must rush to the ferry if he is to find his next story on Gozo. Ever since he landed in Malta, fans have been suggesting he visit Gozo. He has no idea what to expect nor whether he will find a story. He is by now onto his 733rd video – that’s already an entire two years of his daily video creations – and missing a day would for Nas be little short of a tragedy. His video about Senegal and the ‘secret dead sea’, a salty pink lake, comes up in our conversation. Nas is quick to reveal Senegal was a hard place to film: people tried to extort cash from him at every turn. At the airport he was asked to pay for a fake visa and later, filming a sunset outside his hotel, even the porter asked for cash. So why didn’t he make a video about it? He quickly rejects the idea of deriding an entire country. That’s not what he is about. I understand his videos are mainly focused on people (hence the nickname ‘Nas’ – Arabic for ‘people’) but only on their inspiring or eye-opening stories. I respect this but now I feel his Senegal video was somewhat misleading and know I must strike this country off my bucket list. I would have gladly continued this debate, even if Nas can no doubt make a cogent argument in his defence. But we are late for the ferry. During the trip, he is recognised on deck by some tourists, who politely take pictures but luckily no selfies – as he cannot sit still. Hardly a minute goes by that he is not hyperactive and brainstorming his next story. “Tell me more about Gozo. What stories are there?” he asks his local guide. Nas wants something unusual, inspiring. I worry, as I know the island of 31,000 is full of stories which may, however, take a few hours to unearth. We decide to grab the original Maxokk Gozitan pizzas created in a traditional bakery founded 90 years ago. Perhaps there is a story there, we all muse with some desperation. But the bakery staff are in no mind for any conversation and oblivious to the popularity of their esteemed patron. Meanwhile customers arrive and ask for selfies with Nas. It’s a fun and friendly start to this Gozo trip, but there is no story yet and the clock is ticking. As we sit by the sea with our pizza, his inquisitive mind is in high gear, hardly aware of the delicious food. He learns Gozo has a tiny village of a few hundred people and its council has street signs with pictures designed for people suffering from dementia. Bemused, he decides to visit. At short notice, mayor Noel Formosa has no problem greeting Nas. He has just discovered Nas’s Facebook page, someone having sent him a video about immigrants. Earlier that week Nas was violently harassed by a drunk Libyan immigrant and, with the attack on camera, decided to turn it around by dwelling on the prejudice towards immigrants and how we must not allow one bad apple to poison the tree. His story racked up over a million views in days. The local councillors of San Lawrenz have just finished their official meeting and are waiting, cake and all. It is not every day that this small village is visited by an international celebrity. The mayor explains to Nas that 70 per cent of San Lawrenz suffers from some form of dementia. Nas is listening and asking questions while constantly fiddling with his smartphone. He is not rudely checking messages but researching dementia. A few hours have revealed he is great at multi-tasking and possesses the ability to process thoughts with lightning speed. Still, he is struggling to find the right angle for his next video. He takes to the streets to look for the dementia-friendly pictorial signs. When he comes across an empty playground, the story finally hits him. Here is a village that is virtually begging for more children and for new couples to move in because of its aging population. More importantly, here is a mayor who is the antithesis of exclusion and segregation, a subject obviously close to Nas’s heart, brought up as he was in a land caught in everlasting conflict and bloodshed. Having found his angle, Nas fires himself up into creation mode. He is typing fast into his smartphone, writing the beginnings of a script, reciting each line of dialogue and mentally editing his video. He is convinced he needs coverage from the sky, but his drone has broken down. Obviously, having over 100,000 followers in a Facebook group helps in more ways than one. Nas decides to post a call for help, asking anyone in Gozo with a drone to be there before sunset. Locals around him smile at his optimism. But exactly five minutes later a drone enthusiast writes back. Just like a dutiful reserve fireman would run to a massive fire, a local by the name of Adrian is at the square within 20 minutes, drone in hand. They also take on little acting parts, acceding to every direction from this hairy, screaming kid, as Nas likes to describe himself. A 91-year-old man pacing quietly in the square is smitten, and within seconds he is talking into the camera with characteristic welcoming gestures that leave Nas ecstatic. After starting off completely alone two years ago, Nas is now joined on his travels by Agon Hare, a vlogger from Poland, tech genius and musician, and his American girlfriend, Alyne Tamir, who also has a growing online audience. The creation of Nas Daily videos is an ingenious process which, despite the enormous pressures, is creativity at its best. Shot using a standard SLR camera and mounted mic, his Gozo video about a village that needs children will be edited that same night and released to millions the next morning. On the ferry back to the mainland, despite all the running around of the past hours, Nas’s energy is unrelenting. He is reading some of the hundreds of comments from his previous videos and posting some of his own. He claims to read at least 80 per cent of his fans’ comments. Considering he spends half his time working on his phone, this is probably true. As the ferry reaches port, Nas has started to calm down. He cuddles his girlfriend and begins to look like a normal human being, a tourist coming back from a romantic trip to Gozo. We discover that his personal assistant in South Africa is an old friend of mine, and we laugh at the smallness of the world and its bizarre coincidences. During dinner near his hotel Nas gets worked up at the news that his visa application to visit Australia has been rejected twice whilst his Polish team member was accepted despite submitting an identical application. He laments the way people are nowadays judged and discriminated against when processed through visa vetting systems. But his appetite is not lost and he begins to tuck into his burger. He is not ready to give up and plans to re-apply. Nas identifies himself as both a Palestinian and an Israeli because he grew up in Israel. It is clear his provenance, at least by bloodline, is Palestinian, and this is reflected in his heightened interest in the struggle of immigrants. The Middle East conflict is undoubtedly a reminder to him of the hardships of his people and how everyone on both sides of the border deserves to have a normal life and to feel a sense of belonging to their homeland, regardless of their race, colour or religion. There are those who question, as I did at the beginning of the day, why the majority of his videos are not critical of politics, corruption and countries that have gone wrong. I discover that Nas has made a very conscious choice, because he knows what his audience wants. He feels the mainstream media saturates the world with negative stories and seldom highlights the humanity and goodness found in people, including his own. He is fighting that. But his modus operandi of positivity seems to have its limits. A few days ago he surprised his audience with a video claiming he “hates” rap star Kanye West for claiming slavery in the olden days was actually a choice. A few hours following its release he admitted to his followers that he should have used the word ‘disagree’ instead of ‘hate’. He explained his criticism of Kanye was an active choice because he realises false positivity can affect the credibility of Nas Daily. “As counterintuitive as it seems, being negative sometimes makes the positive moments much more positive!” he argued. Whichever way you look at the philosophy of Nas Daily, it is clear that for six million people around the world, Nas is offering a breath of fresh air, a reminder that there are positive happenings out there too, including good people. He offers them hope of a better understanding of why life can be worth living, even if their country does not feel like home.